According to information obtained by KrebsOnSecurity, the arrests may very well be tied to a long-running grudge held by Pavel Vrublevsky, a Russian businessman who for years paid most of the world’s top spammers and virus writers to pump malware and hundreds of billions of junk emails into U.S. inboxes. 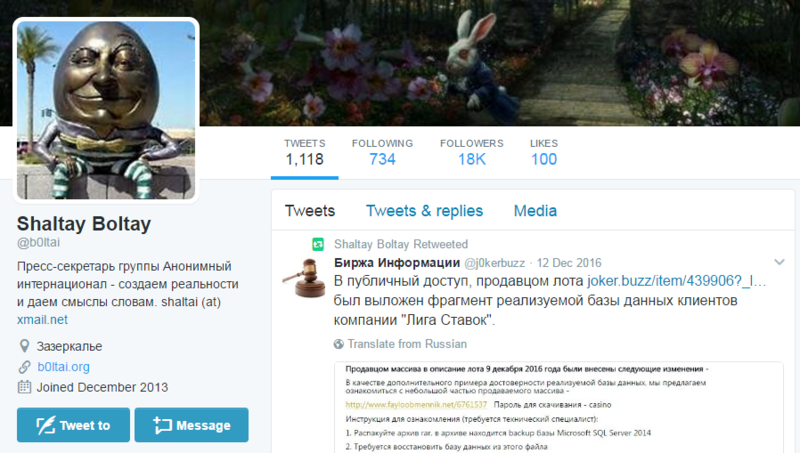 The Twitter page of the blog Shaltay Boltay (Humpty Dumpty). In September 2016, Arlington, Va.-based security firm ThreatConnect published a report that included Internet addresses that were used as staging grounds in the U.S. state election board hacks [full disclosure: ThreatConnect has been an advertiser on this blog]. That report was based in part on an August 2016 alert from the FBI (PDF), and noted that most of the Internet addresses were assigned to a Russian hosting firm called King-Servers[dot]com. King-Servers is owned by a 26-year-old Russian named Vladimir Fomenko. As I observed in this month’s The Download on the DNC Hack, Fomenko issued a statement in response to being implicated in the ThreatConnect and FBI reports. Fomenko’s statement — written in Russian — said he did not know the identity of the hackers who used his network to attack U.S. election-related targets, but that those same hackers still owed his company USD $290 in unpaid server bills. A English-language translation of that statement was simultaneously published on ChronoPay.com, Vrublevsky’s payment processing company. 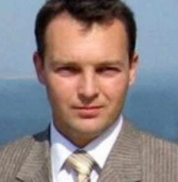 ChronoPay founder and owner Pavel Vrublevsky. I mentioned Vrublevsky in that story because I knew Fomenko (a.k.a. “Die$el“) and he were longtime associates; both were prominent members of Crutop[dot]nu, a cybercrime forum that Vrublevsky (a.k.a. “Redeye“) owned and operated for years. In addition, I recognized Vrublevsky’s voice and dark humor in the statement, and thought it was interesting that Vrublevsky was inserting himself into all the alleged election-hacking drama. That story also noted how common it was for Russian intelligence services to recruit Russian hackers who were already in prison — by commuting their sentences in exchange for helping the government hack foreign adversaries. In 2013, Vrublevsky was convicted of hiring his most-trusted spammer and malware writer to attack one of ChronoPay’s chief competitors, but he was inexplicably released a year earlier than his two-and-a-half year sentence required. Meanwhile, the malware author that Vrublevsky hired to launch the attack which later landed them both in jail told The New York Times last month that he’d also been approached while in prison by someone offering to commute his sentence if he agreed to hack for the Russian government, but that he’d refused and was forced to serve out his entire sentence. My book Spam Nation identified most of the world’s top spammers and virus writers by name, and I couldn’t have done that had someone in Russian law enforcement not leaked to me and to the FBI tens of thousands of email messages and documents stolen from ChronoPay’s offices. To this day I don’t know the source of those stolen documents and emails. 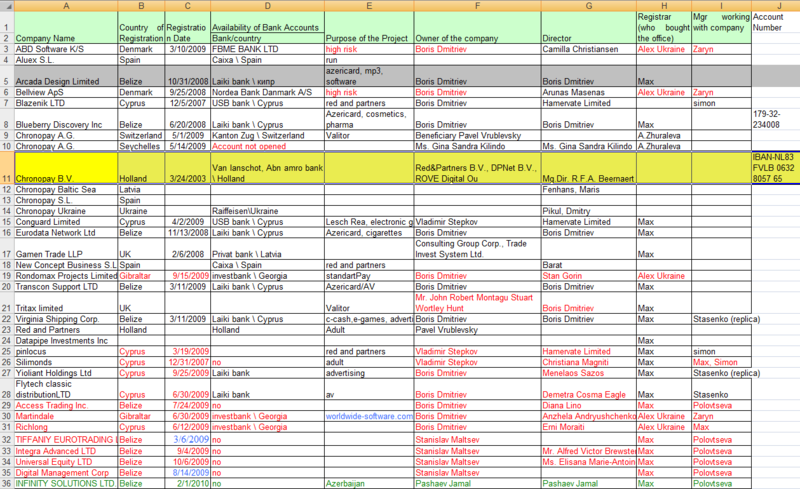 They included spreadsheets chock full of bank account details tied to some of the world’s most active cybercriminals, and to a vast network of shell corporations created by Vrublevsky and ChronoPay to help launder the proceeds from his pharmacy, spam and fake antivirus operations. Fast-forward to this past week: Multiple Russian media outlets covering the treason case mention that King-Servers and its owner Fomenko rented the servers from a Dutch company controlled by Vrublevsky. As it happens, an email that Vrublevsky wrote to a ChronoPay employee in 2010 eerily presages the arrests of Mikhaylov and Stoyanov, voicing Vrublevsky’s suspicion that the two men were closely involved in leaking ChronoPay emails and documents that were seized by Mikhaylov’s own division — the Information Security Center (CDC) of the Russian Federal Security Service (FSB). A copy of that email is shown in Russian in the screen shot below. A translated version of the message text is available here (PDF). A copy of an email Vrublevsky sent to a ChronoPay co-worker about his suspicions that Mikhaylov and Stoyanov were leaking government secrets. In it, Vrublevsky claims Zenz was dating a Russian man who worked with Stoyanov at Indrik — the company that both men worked at before joining Kaspersky — and that Stoyanov was feeding her privileged information about important Russian hackers. Based on how long Vrublevsky has been trying to sell this narrative, it seems he may have finally found a buyer. Verisign’s Zenz said she did date a Russian man who worked with Stoyanov, but otherwise called Vrublevsky’s accusations a fabrication. Zenz said she’s uncertain if Vrublevsky has enough political clout to somehow influence the filing of a treason case against the two men, but that she suspects the case has more to do with ongoing and very public recent infighting within the Russian FSB. 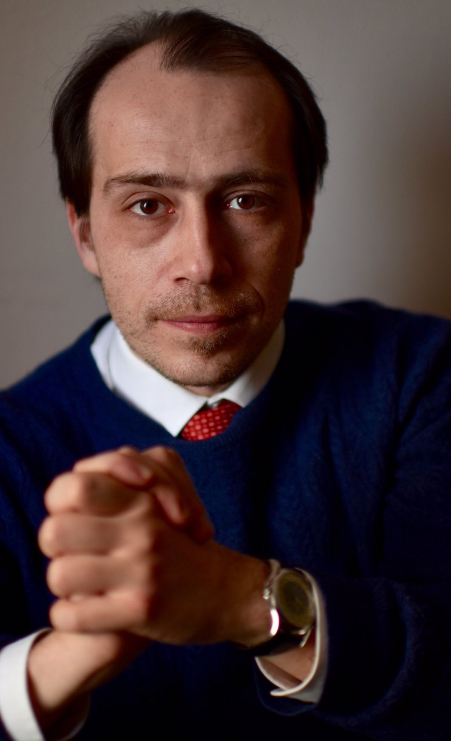 Nevertheless, Zenz said, the Russian government’s treason case against Mikhaylov and Stoyanov is likely to have a chilling effect on the sharing of cyber threat information among researchers and security companies, and will almost certainly create problems for Kaspersky’s image abroad. Vrublevsky declined to comment for this story. King Servers’ Fomenko could not be immediately reached for comment. This entry was posted on Saturday, January 28th, 2017 at 6:42 pm	and is filed under Other. You can follow any comments to this entry through the RSS 2.0 feed. Both comments and pings are currently closed. Any chance this is related to the statements made by Biden after the election hack that they would get back at Russia but wouldn’t say how? Causing a chain of events that would lead to a power struggle and infighting within FSB definitely sounds like something Biden was talking about. sso aat thhis tiome mme also commenting aat this place. to learn aboutt tthis topic. I love aall off thee pointss youu made.